Media: Soft, glossy, laminated colour covers; 21.5cm x 28cm portrait format, 112 good quality satin-finish pages. Advantages: Rare photographs, useful technical detail and the colour aircraft profiles. 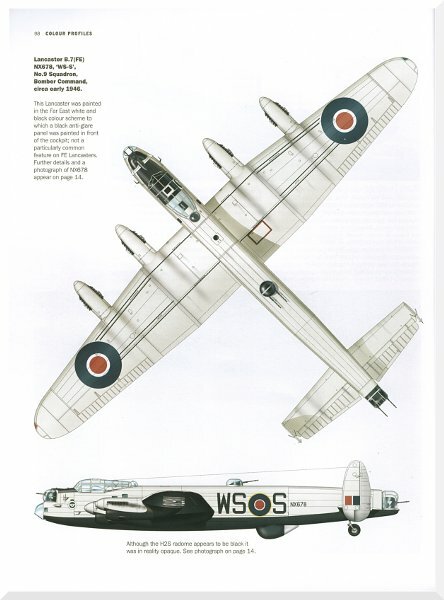 Disadvantages: Perhaps a small point, but only one Avro York profile included - one more, perhaps in a camouflage scheme, would have done the subject more justice. Conclusion: Will add considerably to the reader's knowledge of both the aircraft and this period of RAF history, in a format you are unlikely to find elsewhere. Bombers and transports are often seen as the unglamorous face of military aviation, and this is often exacerbated once the conflict in which they were used, is over. Such is the case with the subjects of Dalrymple & Verdun's latest title, Avro's Lancaster, Lincoln and York. Linked by dint of their manufacturer, this new title seemingly does not fit with anything they have done before (perhaps the 'Hastings' from back in 2008 might qualify), but despite this apparent lack of focus, Dalrymple & Verdun are nevertheless cementing a reputation for interesting and little-known subjects, backed by rare photographs and insightful technical detail. In this case, apart from one page of colour photographs of Avro Yorks and the colour provided by the aircraft profiles at the end, the rest of the book's narrative is, by my reckoning, illustrated by some 152 black & white images of the three subject aircraft. Many of these images are from the author's own collection, but also from other well-known contributors and from the extensive archive at the Newark Air Museum (Nottinghamshire, UK). After the initial 'Setting The Scene' preface, where the legacy of the Second World War is outlined in terms of both the bomber force and the air transport situation, the first chapter proper, begins by concentrating on the bombers. This chapter covers a period in the immediate aftermath of the war, in which large volume production and future developments (such as the Lincoln), were predicated on the expectation of the conflict lasting well into 1946 and possibly beyond. As we know, the dropping of the two atomic bombs soon changed all that and the book describes the rapidly changing situation, leading to production cancellations, as well as the storage, mothballing and the inevitable scrapping of both long-serving and indeed, unused aircraft. Equally swift, was the scaling back of the RAF structure and commitment, with squadron's merging or disbanding and large numbers of personnel returning to civilian life. Whilst each of the book's chapters contains an initial few pages of commentary on the subject at hand, a large amount of information is actually contained in the copious caption notes accompanying each photograph. Despite the changing times, we see in these pictures, normal service life continuing, including a large contingent of RAF Lancasters which took part in a 'Good Will' tour of the USA. Here also, the Avro Lincoln makes its début, an aircraft which many people may not be too familiar with. The inherited RAF bomber group structure is also explained and the inevitable post-war changes, tabulated. 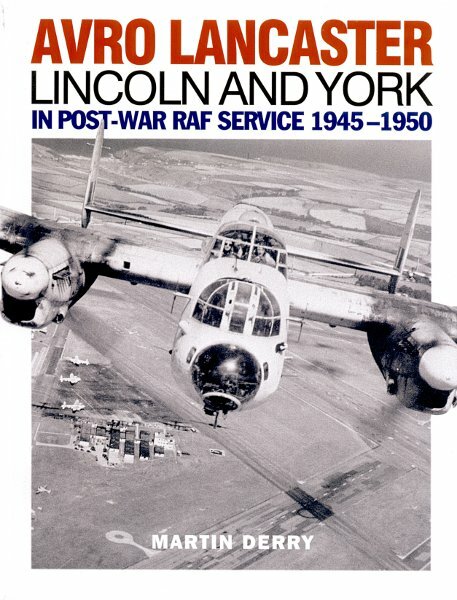 Chapter two, looks at other Lancaster and Lincoln units of the 1945-1950 period, one in which the inevitable surplus of both types, allowed for numerous training and development units to be established. 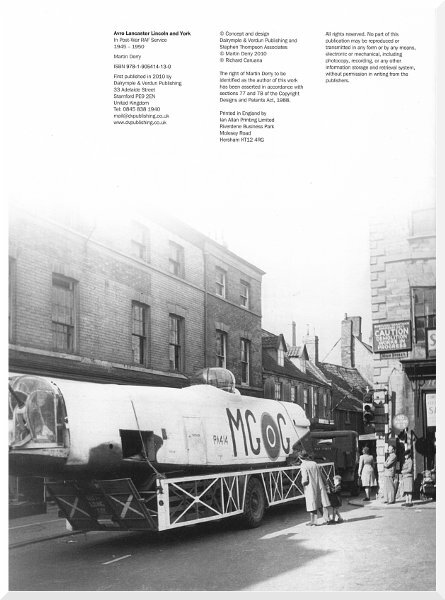 Perhaps of particular interest to the modeller here, are the modified trials aircraft discussed in chapter three, used to test various engine types. For example, there are some particularly interesting shots of; the Canadian Lancaster used to test the Avro Orenda turbojet, one of the Lancasters used to test the Merlin 85 for eventual use on the Lincoln and my favourite, the Lancaster and Lincolns used to test the Armstrong Siddeley Python engine, with contra-rotating props, for use on the Westland Wyvern S.4 naval strike fighter. 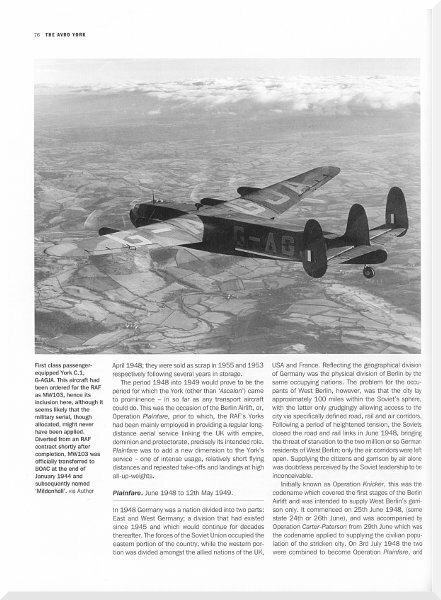 Also included, is a photograph of the very first in-flight refuelling using the probe and drogue system, between a Lancaster and a Meteor, illustrating the scale and extent of aviation development being undertaken in the UK during the post-war period. To conclude the story of the bombers and their legacy, chapter four looks at the RAF's maritime Lancasters, showing that service life still had a duty to perform, even in peacetime. Although their role was destined to be assumed by the Shackleton, suitably modified Lancasters, fitted with more capable radar and with the ability to drop a lifeboat, carried out the Air Sea Rescue role. Meanwhile, others were used to test and develop weapons and tactics for deployment over water. All this is again covered in the many excellent photographs. Somewhat belatedly, we get to chapter five and the Avro York in the transport role. To the uninitiated, the York might seem to be unrelated to the forgoing, almost an aircraft from another era, but was in fact a direct development of the Lancaster. In many ways, this was a shrewd move by Avro, who realised that without hands-on experience of designing transport or passenger aircraft, they would be at a competitive disadvantage globally (come the end of hostilities), with most British manufacturers having in the meantime, had to concentrate wholly on the design and production of combat aircraft. So what do you do? Well, you take the wings, engines and tail from the Lancaster and marry them to a square fuselage, more suited to the transport function. Naturally, it was not as simple as that and the chapter takes the reader through the intricacies of getting all that to work. This final chapter also looks in more detail at the York's role in 'Operation Plainfare', more popularly known as the 'Berlin Airlift' and concludes with short pieces on the York in other guises, such as with the French Naval Service, RAF service for troop carrying and in partial civilian guise ('Demobbed') but carrying out occasional military duty. We are not quite done with the overall story however, as there are two final appendices. Appendix One looks in more detail at 'Tiger Force', the proposed force of RAF bombers which had been expected to be needed to take the war to the Japanese on their own soil and Appendix Two; describes RAF Lancaster operations in Palestine, during and up to the end of the British Mandate and the resultant birth of the state of Israel. 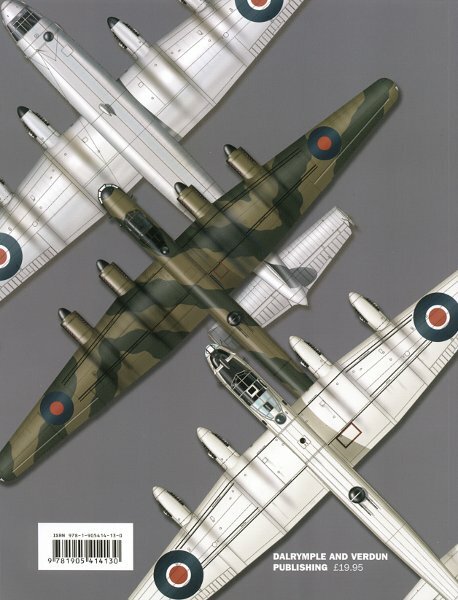 As alluded to earlier, the book concludes with a page of three colour photographs of Avro Yorks, followed by 14 pages of 4-view, colour artwork profiles of three Lancasters, three Lincolns and one York. Although not overtly credited, I assume that these works are by none other than Richard Caruana, as he is mentioned in the list of copyright holders in the inside cover pages. Perhaps the only criticism here, is that only one York profile is included, in a natural metal or Aluminium finish. One more York, in a camouflage scheme, would perhaps have done the subject more justice. The final page contains both a bibliography and a list of the abbreviations used throughout the text. On the whole, we do not tend to appreciate the bomber or transport aircraft, in quite the same way as the more glamorous fighter types. As I said at the beginning, this is then compounded when thinking about the former in peacetime roles. There is certainly much more to these 'lesser' types than is generally known and this latest volume from Dalrymple & Verdun, will add considerably to the reader's knowledge of both the aircraft and this period of RAF history. As usual, there are some great photographs, the majority of which are unlikely to have been seen in print before. Other books may give you 'chapter and verse' on the main histories of the three aircraft covered by this volume, but what this book does do, is give the reader an insight into their less well known roles and duties, at a time of great change and in a format you are unlikely to find elsewhere.